Craig Colton’s article reports on the RPD standards development activities of ISO from the committee’s perspective. It poses several questions relevant to industrial hygiene and safety practitioners but does not offer opinions or suggest answers. Like Mr. Colton, I am a member of the U.S. Technical Advisory Group and would like to provide my perspective. First and foremost, the standards in development are economic standards meant to reduce barriers to trade. Harmonization is good for respirator manufacturers who, in principle, would be able to sell their products internationally without submitting them to multiple approval authorities. Mr. Colton also notes the benefits to multinational corporations who want to standardize respirator selection and use across their facilities. It is not clear how many organizations really have this need. Aside from the two groups noted, we need to consider the positive and negative effects the suggested changes to RPD would have on the safety and health community. Importantly, smaller employers with facilities in a single country have no reason to care what the rest of the world does with respiratory protection. My experience suggests they are concerned with protecting their workers with the least possible interference with production. Nonetheless, changing RPD classifications will require changes to their respiratory protection programs, along with the associated retraining, fit-testing, and other associated costs. The proposed RPD classification system is significantly more complex than those currently in use. Rather than asking, “Will employers and workers be able to make the transition from N95 to PC3 W1 bT F2 RPD?” as Mr. Colton does, I would ask, “Would there be a safety and health benefit to making this transition?” Complexity breeds confusion that can increase error. In addition, there is no technical basis for the complex particle filter and work rate components incorporated into the ISO classification system. (I have repeatedly asked for any supporting data and received none.) In truth, existing data show that particle respirator selection could be simplified without compromising protection. Time spent by employers making unnecessary work rate estimates for filter selection is time not available for other, productive work. Regarding the question “Will ISO respirator standards do away with APFs?” posed by the article’s subtitle, we again should ask if there would be a safety and health benefit to doing so. The ISO committees propose changing the term “assigned protection factor” to “protection level” (PL), which is not a problem in itself. However, the PLs are to be earned by RPD based on laboratory total inward leakage (TIL) testing. The PLs currently suggested in the ISO proposals are based on the range of existing European APFs and a safety factor based on “expert judgment.” In other words, educated guessing; no TIL test has ever been shown to correlate with workplace performance. In fairness to the ISO committee, the current proposal suggests using existing APFs until the PLs can be validated with workplace testing. As Mr. Colton notes, a number of OSHA’s APFs are based at least in part on workplace testing, and others are based on design analogies to the tested RPD. OSHA assigned APFs to respirator classes rather than TIL tests because existing data bear out that approach. It is illogical and potentially less protective to even consider PLs based on TIL tests for the sake of harmonization. The APF issue points to the need for more emphasis on workplace testing of existing RPD. In truth, real-world respirator performance of existing RPD is not as well understood as it should be. How can we predict performance for yet-to-be designed RPD if we don’t fully understand our current devices? We believe our design analogies are correct, but workplace testing would provide assurance. Aside from half-facepiece particle-filtering respirators, OSHA’s APFs are based on a very limited number of studies, and some of the studies available during rulemaking were quite old. Even Mr. Colton seems unaware that relatively recent work published in 2007 by JOEH has shown that full-facepiece respirators in the U.S. have “come close to” (or exceeded) the European nominal protection factor of 1000 (I was coauthor of the study). As that study suggests, it is possible that some of the existing APFs may actually be too low. The ISO respirator standards need more consideration by and input from practicing industrial hygienists. Existing data show that our current RPD, regulations, and practices are protecting workers. This is their purpose. Most members of the ISO standards committees are not IHs, and very few have experience managing respiratory protection or other safety and health programs. It is not clear to me they appreciate that changes to RPD and respirator program requirements would take time and resources away from other components of an organization’s safety and health program. If those changes don’t significantly enhance worker protection or comfort, they should not be implemented. Given that several countries’ standards organizations and some respirator manufacturers have invested substantial money and time in ISO standards development, it is likely there will be significant pressure to adopt, at a minimum, ISO-compliant RPD. That is acceptable only if the ISO requirements for those devices are based on the best available data, and benefit workers as well as overall safety and health programs. The industrial hygiene community is uniquely qualified to guide ISO in the development of protective yet practical RPD standards. LARRY JANSSEN, CIH, is an industrial hygiene consultant in Stillwater, Minn. He can be reached at (651) 430-0815 or lljanssen@centurylink.net. 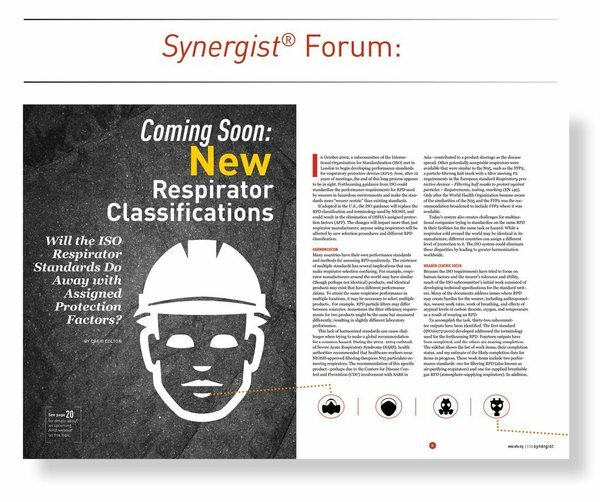 Editor’s note: In the October 2014 Synergist, Craig Colton’s article “Coming Soon: New Respirator Classifications” discussed forthcoming guidance from the International Organization for Standardization (ISO) that would standardize performance requirements for respiratory protective devices (RPD). Below, The Synergist presents another perspective on this issue from Larry Janssen, CIH, and a response from Colton. Both writers are members of the U.S. Technical Advisory Group to the ISO subcommittee developing the new RPD standards. RESOURCE Journal of Occupational and Environmental Hygiene: “Performance of a full facepiece, air purifying respirator against lead aerosols in a workplace environment,” April 2007. I thank Larry Janssen for his thoughtful feedback. I agree with several of Mr. Janssen’s comments, including that the industrial hygiene community is qualified to help guide the development of practical RPD standards. As I hope was evident, my point in the article was to inform the interested readers, including industrial hygienists, of this ISO activity without opinion. My perception is that many industrial hygienists unfortunately are not aware of this activity; the IH community cannot participate if it lacks that awareness. While I can agree that “[e]xisting data show that our current RPD, regulations, and practices are protecting workers,” this does not mean that harmonizing standards will be unable to retain the current results on protection while also yielding additional long-run benefits, such as harmonization. (I also note that respirator users may or may not desire harmonization and that, contrary to Mr. Janssen’s assertion, harmonization may or may not be good for respirator manufacturers. It is my understanding that respirators will still need to go through a country’s “approval” procedures and that the country’s testing bodies will have determined that the RPD meets the ISO requirements before it received the country’s regulatory approval.) Once the new proposed standards are finalized, I agree that the safety and health community should be involved in the final stage of determining whether to adopt, incorporate, or reject—considering the ISO standards’ form and substance, and including addressing the issues raised in Mr. Janssen’s letter and my article. I agree that one of these issues is TIL and how it relates to all of the models and classes of respirators. However, I am cautious regarding the use of TIL to set workplace protection levels. Even in the work cited by Mr. Janssen, the authors concluded that the “results support the APF of 50 for this respirator” while the WPF (workplace protection factor) values were “well above its [full-facepiece air-purifying respirator] APF of 50.” In addition, other WPF studies for current full-facepiece respirators indicating different levels of performance need to be considered as well. One such study is listed below. While all three of the respirators tested meet the European TIL test resulting in a nominal protection factor of 1000, the workplace results are different for each model, confounding their relationship to the TIL test. In addition, the ISO TIL test offers three different test methods for the laboratory. Overall, we agree that “existing data show that our current RPD, regulations, and practices are protecting workers. This is their purpose.” As today’s world becomes increasingly global, however, ISO seems to appreciate the need to explore the potential for consistent global standards and nomenclature for respiratory protection standards. Hopefully, my article and Mr. Janssen’s response will help promote awareness within the industrial hygiene community and the need for industrial hygienists to get involved in developing and finalizing these ISO standards. CRAIG E. COLTON, CIH, is division scientist for regulatory affairs for 3M in St. Paul, Minn. He can be reached at (651) 733-6297 or cecolton@mmm.com. RESOURCES American Industrial Hygiene Conference abstract #185: “Workplace Protection Factor Study on a Full Facepiece Respirator,” 1989 . European Committee for Standardization: Respiratory protective devices – Recommendations for selection, use, care and maintenance (guidance document EN 529:2005), 2005.